One of my favorite finds with my Deus happened recently on a large group hunt in Virginia. 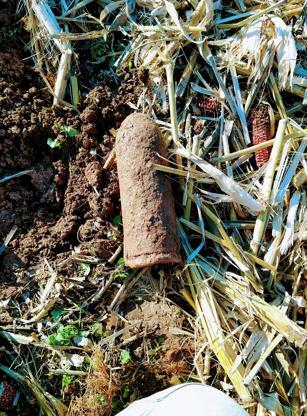 Before the hunt, it had been reported that the location had great potential for finding whole artillery shells. I was excited at the possibility of finding one but didn’t really expect it to happen. Early in the morning, we all gathered around I the cold for a brief overview of the property, and then everyone was off like the horses at the races. I decided to walk up the hill directly behind us where a Confederate artillery battery had been located during the engagement. It was covered in low corn stubble, and I was taking my time listening for good signals. The field was fairly quiet with very little trash. I got a good signal and out popped a 44 cal. Pistol bullet. This was a good start. As I crested the hill, I hadn’t found anything else. I continued down the other side, and as the ground began to flatten out, I searched back and forth between the corn stubble and found a couple of shell fragments. I then got a big iron signal. As I pushed the shovel into the ground, it broke the dirt away to reveal the base of a shell. I then knelt and used my hand digger to dig the dirt away. To my surprise, it was a whole Parrott Shell. The base was only about an inch under the dirt, and the tip was covered by no more than 4 inches of dirt. I radioed to my husband and the rest of the group I was hunting with that “I had found a shell.” My husband’s response, “Do you mean like a whole shell?” HA! I tried to continue to hunt for about an hour with it in my pouch but finally decided to take it to the vehicle. It was nearly impossible to locate a target while kneeling with it. This find made the hunt for me, but I found some other items that day to include a gold ring and an 1863 Indian Head. I love hunting with my Deus and the finds it recovers.